Editors Note: Since Philadelphia is known as a city of neighborhoods, we asked Temple Law students, faculty, and staff to talk about what they love, hate, and can’t live without in their neighborhood. Each month, we’ll release another write-up of a new Philly neighborhood. I ended up living in Old City by pure chance. When my wife and I married in October 2011, we decided to move into the city to experience urban living while it was still feasible. Looking online, we targeted the neighborhood of Queen Village, located south and east of Center City. A few weeks later, filled with optimism, we ventured into the city one Saturday morning to walk about the neighborhood searching for open houses and available apartments. After just a few hours, our optimism had turned to frustration thanks to a lack of apartment options and the realization that most real estate offices weren’t open. Around lunchtime, however, we experienced a stroke of luck when a gentleman, stepping outside of his home and assuming we were lost, asked us if he could help us find anything. “Yeah, an apartment,” I sarcastically replied. “I have an apartment,” he said. Three hours later, at the corner of Strawberry and Chestnut, right in the heart of Old City, I found myself signing a lease on a small one bedroom apartment, with central air conditioning and in-suite laundry, for $950 a month. Over the next two years, I realized how lucky I was to find a place in Old City. 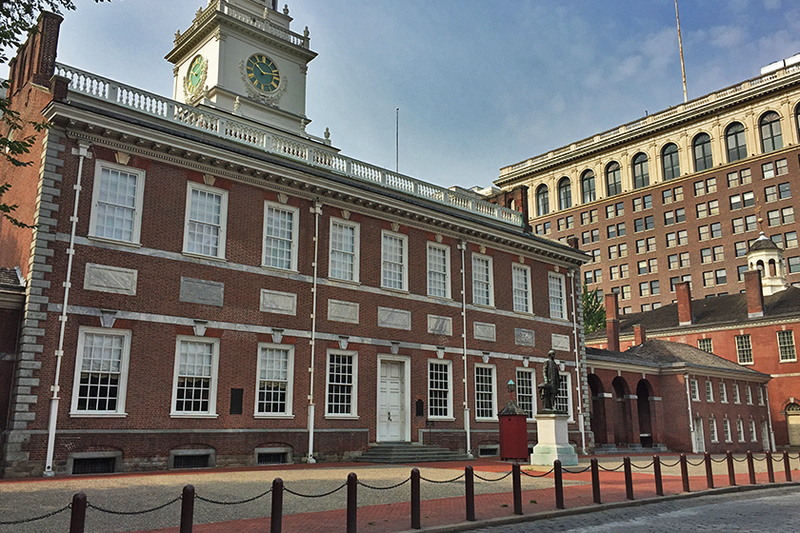 From casual strolls past the literal birthplace of our nation to fine dining and easy access to public transportation, Old City has a lot to offer. Old City is beautiful. While most cities are known for their tall skyscrapers and busy streets, Old City maintains an unmistakable charm with green spaces, historic buildings, cobblestone streets and pathways, and even horse drawn carriages carrying tourists through the neighborhood. Since Old City is one of the most visited areas of the city, I often felt that it was one of the cleanest and safest areas of the city. It’s also one of the busiest. Penn’s landing, situated directly on the Delaware River, has transformed from a place known for its winter skating rink and summer fireworks displays to a cultural hotspot, which hosts a ton of concerts in the summer to go along with movie nights, festivals, and one of the best pop-up beer gardens in the city. For the more active crowd, Penn’s landing is also home to a great path that borders the river and runs from Market St to South St.
It’s also a culturally rich and walkable neighborhood. There are a number of highly-rated restaurants and bars on Chestnut Street, shops and cafes on Third Street, and art studios that open their doors and give out wine every first Friday of the month on Second Street. There are also three movie theaters in the neighborhood, each of which shows a mix of new releases and independent movies, with special movie ticket pricing on Wednesdays. Old City is not without its faults. For one, the area south of Market Street is loud, especially late at night and on weekends. The southern side of Old City is home to a variety of clubs, all of which close down in the early morning hours, releasing a rush of loud, amped up party-goers operating at varying levels of intoxication. If you’re a law student looking to carve out some late-night studying time in a quiet environment, you may need to look elsewhere. How I get to Temple Law: The Market-Frankford and Broad St subway line during cold weather; bike during the summer months. And while you don’t need to keep a car in the city, Old City should not be your neighborhood if you insist on doing so. Parking is limited and expensive where you can find it, and traffic is a constant presence throughout the neighborhood. Finally, despite my lucky break in apartment shopping, Old City can be pricey. Studio apartments generally run around $1,000 a month, while one bedroom apartments can range anywhere from $1295-1695 and two bedroom apartments sit around $2,000 or more. Keep in mind, many of these apartments don’t offer much outdoor space beyond a communal roof deck, but many feature hardwood flooring, in-suite laundry, and central air conditioning. As mentioned earlier, Old City is a very walkable neighborhood, but when the weather doesn’t cooperate, there’s plenty of public transportation to be had. The Market Frankford subway line runs east and west along Market Street, makes two stops in Old City, and offers easy transportation to Center City and Northern Liberties. Generally speaking, there is a train every eight minutes. Due to its popularity with tourists, Old City is also brimming with taxis, should you need to make the trip down Columbus Boulevard to Target, Ikea, Marshalls, or Home Depot. To get to Temple Law School on a daily basis, I relied on the subway. I caught the Market Frankford line at 2nd Street station, and then transferred to the Broad Street Line at 15th Street Station. I took the Broad Street Line north to Cecil B. Moore Station, which is located a block away from the Law School. All told, my commute took anywhere from 15-30 minutes, depending on my timing when transferring. If you’re thinking of moving to Old City, chances are you aren’t going to run into a landlord with an empty place while aimlessly exploring the city. (Then again, maybe you will. Philly is like that.) But while my wife and I definitely experienced a stroke of luck, you too can find the apartment you’re looking for in Old City. Law students use a variety of services to find an apartment in Philadelphia, and the Temple Law Office of Admissions has rounded up some of the most popular options on their website. I spent two years in Old City, and I loved just about every minute. If you’re looking for a safe but bustling neighborhood close to public transportation, Old City is a great option. You’re very lucky to live right on the perfect spot. Every thing that you need is very accessible. I live on a rustic type apartment close to the city center. The advantage on living on this type of area is that everything that you need is just there close to you. Hello Stephen, I must say you find the better place in the Old City. It is located in the center, accessible, clean and safe. And of course, I would love to experience walking and seeing these historic buildings, cobblestone streets and pathways there. Next PostDoes the U.S. Issue More Green Cards for Permanent Legal Immigration than All the Rest of the Nations of the World Combined?